Why a janitor ends up with a higher tax rate than a millionaire, and seven more charts that show how the richest Americans beat the IRS. Click here for more charts on America’s growing income gap. “We don’t pay taxes. Only the little people pay taxes,” billionaire hotelier Leona Helmsley famously (and allegedly) sniffed. She wasn’t entirely correct: The superrich do still pay taxes. The wealthiest 1 percent of taxpayers pay 32 percent of all income tax collected by the federal government. But the superrich don’t pay as much as they used to—and thanks to a combination of tax cuts and preferential tax policies, their tax obligations can be less demanding than the so-called little people’s. In fact, the very wealthiest Americans’ tax burden has been steadily dropping for years, even as they’ve enjoyed astounding income growth not seen by the vast majority of Americans. 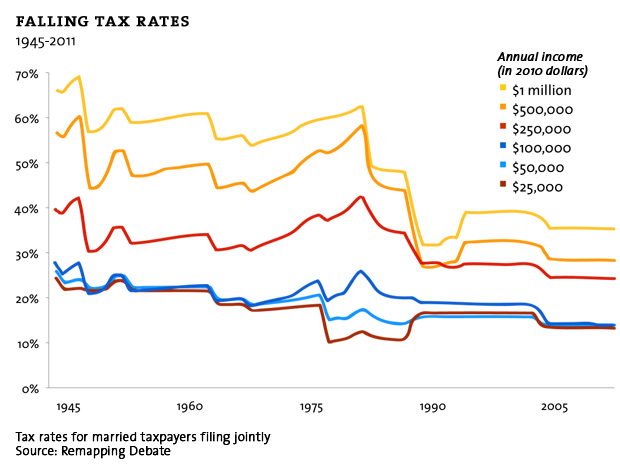 Tax rates for the wealthy have fallen substantially since they peaked in the 1940s. During the past 30 years, they have been cut at a much faster rate than middle- and low-income taxpayers’. Just how much of a windfall are tax cuts for the wealthy? The extension of the Bush tax cuts passed last year will provide $146,000 in annual tax savings, on average, to each of the wealthiest 0.1% of Americans. 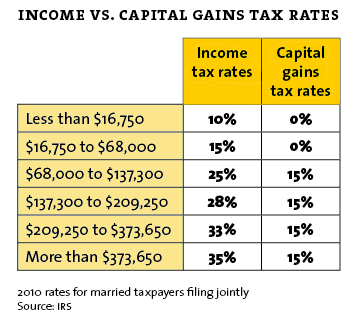 The superrich get an additional boost from relatively low tax rates on capital gains. 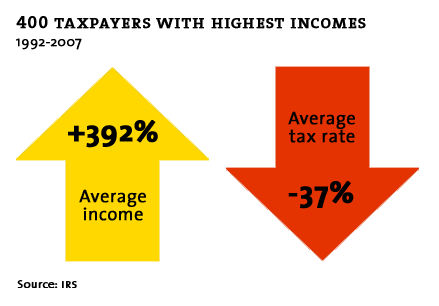 Income from long-term investments, which makes up a larger portion of wealthier taxpayers’ incomes than middle- and low-income taxpayers’, is taxed at lower rates than wages. Payroll taxes (deductions for Social Security, Medicare, and unemployment insurance) are mostly paid by the bottom 90 percent of earners. When they’re factored in on top of income tax, the gap between the tax rates at the very top and everyone else shrinks even more—so much that the effective tax rate for people earning more than $370,000 is nearly the same as for those earning between $43,000 and $69,000 a year. 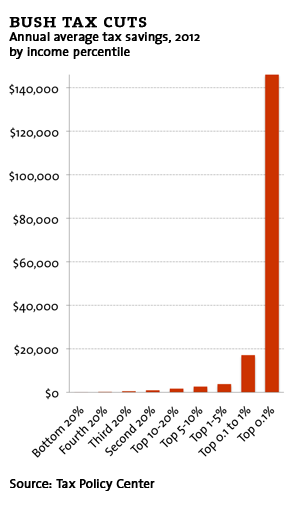 Payroll taxes now make up nearly as much of federal tax revenue as individual income tax. 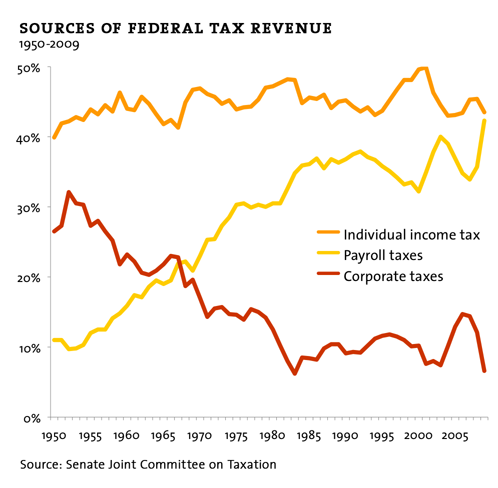 Meanwhile, revenues from corporate taxes have decreased significantly over the past 50 years. Corporations exploit various loopholes and tax breaks to reduce their IRS bills—perhaps none more notoriously than General Electric. 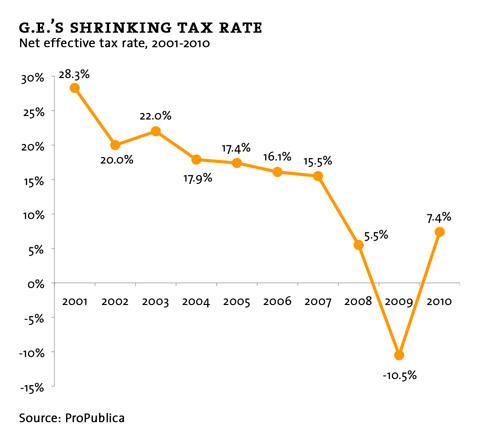 Though the corporate tax rate is 35%, GE has paid nothing near that for nearly a decade. 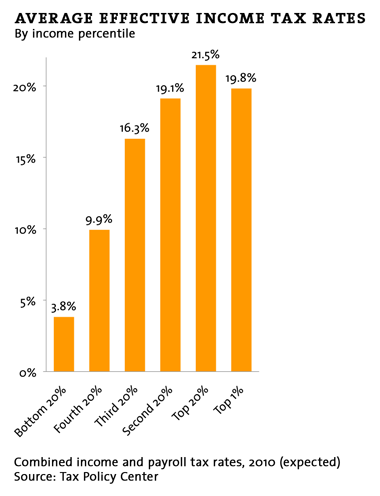 More Mother Jones charty goodness: 11 charts that explain America’s income gap; how the rich get richer; how the poor get poorer; and who owns Congress?